Yammer is a networking service that is part of Microsoft O365. It enables users to take part in conversations about topics within groups. Every Yammer user has their own profile with basic details but also interests and expertise. They can search for the groups, conversations, people, topics, notes and files that they are interested in. Please note, Yammer does not work on Internet Explorer 8 or 9. Profile – This is information about yourself. It allows people to find you on Yammer and offers you access to groups you might be interested in. Your profile should be short, relevant and only contain information you would be happy for anyone to see. Your profile is where you enter your interests and expertise. People – Everyone can see everyone who is in Yammer. People in a group are referred to as members. Groups – These keep like-minded people together. Groups can be public (anyone with a Glow login can join) or they can be private. Private groups should not be switched to public without informing all members in advance and ideally having consent of all members. Search – Yammer has its own search. This means that it is easy to find groups that may already exist before you create a new one. Topics – Like hashtags on Twitter, topics allow conversations to be organised. Topics are shared across groups, so if a topic is created in one group it is seen in others (however, conversations remain private). Yammer allows you to create groups for people that share a common interest, for example a department, faculty or for a group of teachers from across Scotland. Resources can be shared and reviewed within the group, and users are alerted when content in the group changes. Content on Yammer is monitored and should be appropriate for Glow. If you are unsure, please check and follow the Glow Community Rules at all times. If you see any content that causes you alarm or distress, please Report a concern. Read the Day 1 guide – The Day 1 Guide For Yammer is specific to Glow and provides information on how to get started and how to get the most out of the service. Join a group – You will be part of the ‘All Company’ group by default, but you can join any public group. You will see them listed on the left of your Yammer screen. You can leave a group at any time by hovering over ‘joined’ and choosing to leave. Follow someone – You can choose to follow someone to see all of the posts in their feed (unless it is a private group). Reply to a conversation – Replying to a message is a core part of what makes Yammer useful. When you reply to a message, Yammer starts a conversation ‘thread’. Like a message – The person who posted the message will get a notification that you have liked it. You can like a message to show that you’ve read it or agree with what has been said. Check your inbox – This allows you to view, prioritise and manage all of the conversations most relevant to you in Yammer. 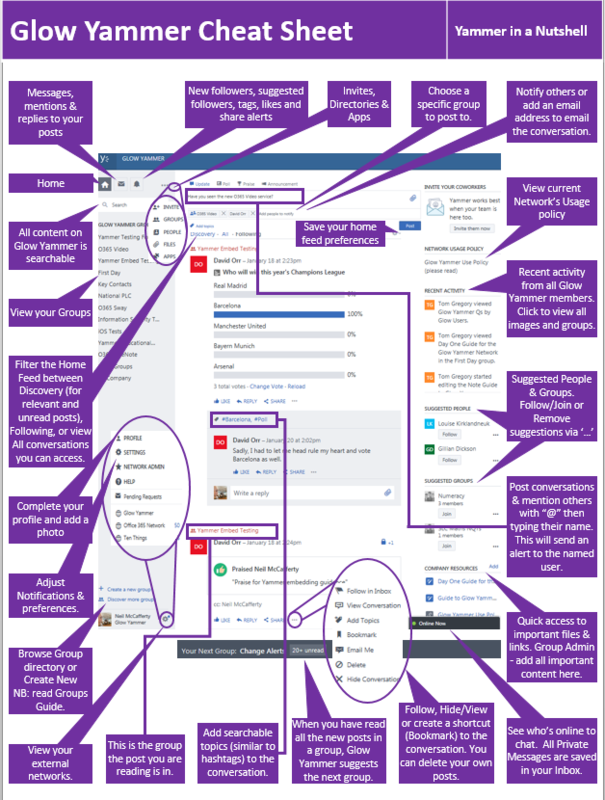 Using Yammer – This Yammer ‘cheat sheet’ provides more detailed information about using the service. Embedding Yammer elsewhere in Glow – You can embed Yammer in other sources such as SharePoint Online and other web pages. This might be in the form of a ‘Like’ or ‘Follow’ button. Signing out – To sign out of Yammer, click on your profile image and use the ‘Sign Out’ option. Follow the on-screen instructions to sign out of RM Unify, then – importantly – fully close the browser.